Imagine a society where women are not recognised as people. It seems remote from us in Australia, but women's recognition before the law is relatively recent — particularly the recognition of married women. Before the late 19th century married women could not hold property. They had no legal standing to sue, and were subject to their husband's rule over their financial standing and their very bodies. Indigenous women's full civic participation has been even more recent: where non-Indigenous women made strides in civil rights, Indigenous women remained for a long time subject to state oversight. For non-Indigenous women, the Married Women's Property Acts in the 1880s changed everything by recognising married women as people before the law. The Acts were seen as liberating for women, and as a measure of women achieving economic equality with men. Sadly however, in 2016, women's economic standing continues to lag behind that of men. This is the case not only for those who can afford to acquire property, but for women in all parts of society. Despite women having the right to education, participate in paid work, and hold property in their own right, several factors stand in the way of women's economic independence, and consequently, their liberation. There is a persistent gender pay gap — women across the board earn less than men. Industries in which women work pay less than those in which men work, and in other industries men tend to take higher paid positions where women take lower paid positions. The gender pay gap flows through to superannuation — if you earn less, you save less super. Time taken out of work for having a child — with paid leave diminishing rather than growing — interrupts women's progression and inhibits their ability to improve their job prospects, keeping wages down. Compounding the effect of women's generally lower pay is their disproportionate unpaid care work. Child rearing and caring for the elderly or infirm leave women less available for paid work. Women therefore tend to take part time or casual jobs, which allow some flexibility to fit in their caring responsibilities. Otherwise, women rely on childcare or respite care to free them up to work. Of note, childcare remains a 'women's issue', emphasising the nature of caring work as women's work but also the reality that it predominantly affects women. The workplace has come some way to accommodating the realities of home life through carer's leave, but generally paid work is based on a model of full time presence. "The challenge is how to allocate caring responsibilities throughout society, while allowing also for the paid work that secures economic independence." Where women have fewer economic resources, especially if they have dependent children, they must rely on a partner or the state. 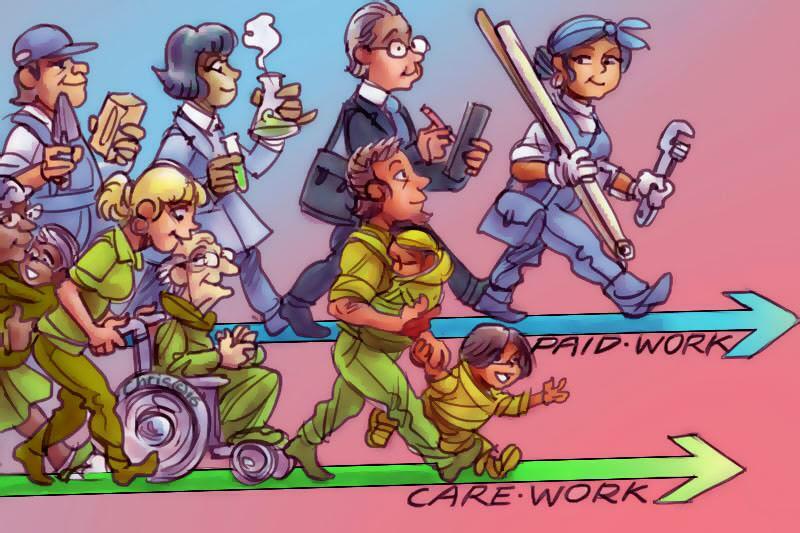 Civil society requires care work. All of us, at various stages of our lives, will be dependent on others for our daily needs. Most of us will likewise care for others at some point. The challenge is how to allocate caring responsibilities throughout society, while allowing also for the paid work that secures economic independence. At the moment the tacit expectation that women will do unpaid care work — and that men (theoretically) are unburdened by care work — contributes to economic inequality. There have been attempts to equalise women's economic outlook. Anti-discrimination laws or sometimes affirmative action laws have attempted to deliver opportunities for women in the workplace. But these laws have done little it seems to address the care work/paid work imbalance. What we need is a fundamental shift in how we allocate care work that shares the burden more effectively. What if, for example, both men and women worked a maximum number of hours per week in paid employment, and a minimum amount per week in unpaid care work. What if we established social norms, supported by government policies, that changed the way we allocate paid work and caring work. This is the proposal of Canadian legal philosopher, Jennifer Nedelsky. As the nature of work is itself changing, a transformation that equalised responsibility for caring would even out hierarchies in our outdated model of working life. As Nedelsky argues, care would become explicitly valued, policy-makers would experience caring to understand the issues at stake (and therefore develop better and more responsive policy), and our relationships would be enhanced. The role of the state in promoting this change is important, requiring various policy measures we currently lack. For example, providing successive parental leave for both parents, including tax breaks for employers, would encourage men and women to take leave. Extended leave would ensure care for babies and small children, and meet the threshold for care work. In Sweden for example, nearly 90 per cent of fathers take paternity leave. It has become a social norm that men are actively engaged in caring for their babies. While there may be few risks for the affluent of cutting their paid work, those in low paying jobs would suffer, presumably, from a drop in their paid hours each week. For this reason, the state needs to establish a guaranteed minimum income. This is a threshold amount of money, paid regardless of one's employment status or circumstances. The amount paid would ensure a baseline living standard that supports caring work, and which can be supplemented through paid work. There are arguments that measuring or putting a value on caring might somehow devalue it as an expression of altruism or love. I reject these arguments. Even as men are increasingly contributing to housework, they still carry the benefit of higher pay and the economic advantages that brings. Until we significantly redistribute care work, and provide recompense for that work, we will not see the economic liberation of women. Nedelsky's proposal, as radical as it seems, is one way to do that. The whole concept of "work" needs to be re-defined. Care credit hours could be aggregated over time that contribute to tax-funded pension entitlements for carers (especially older women who have little or no superannuation); pooling sick/compassionate leave entitlements in the workplace (NAB has had this in place) would generate more flexibility IN the work environment; government-funded training opportunities for carers (as the UK has had) would help prepare carers better for return-to-work; and other options to ensure continuing viability of businesses during times of illness or carer responsibilities whilst at the same time addressing gender inequality in financial independence as a key priority for society overall into the future. Of course, history tells us that wars may occur which again changes all the dynamics of work ... and the digitisation of work is also impacting on employment and unemployment, work both paid and unpaid, and work roles (paid and unpaid). As someone who was once a member of VECCI, and actively advocated for work & carer needs to be addressed ... for the sake of employers, their employees and carers... it was constantly met with open gaffawing and hostility. It was just easier to talk sport and wealth creation, along with the retention of linear thinking ... any problems at work just either contract it out (EAPs; counselling etc) or encourage early retirement. Such limited thinking diminished everyone in the process; it became unbearable to witness. There is so much that can be done (my MPH unlocked many options) ... it needs wise people, with the necessary respected authority and commitment, to take it forward. Bring it on!